The goal of the strategy is the retention of the balance curve from drawdown. Uses the engine of the Prototype-2 Expert Advisor with the addition of "smart hedge". The EA passes the test on 16-year history, proven to work on real accounts. The default settings are for EURUSD M15. Differences between "Prototype-2 Smart Hedge" from "Prototype-2"
The Expert Advisor does not use SL and TP, positions are closed by market, so keep the terminal in a fully serviceable condition. The code provides backup of files in which the variables used in the program are stored. In case of terminal failure, trading will continue from the same place automatically. Opens and close multiple orders, so connect to your account the Rebate service to return a part of the spread of a closed order. 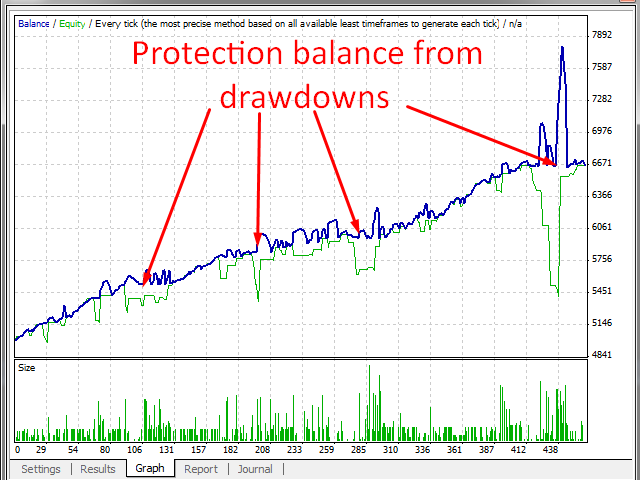 The restraint system of the balance curve from drawdown. Depending on the strength of hedging (parameter HedgeForce), the system controls position closing and sets an opposite order in the event of drawdown. The system controls that open orders do not exceed the limit, and if possible closes unnecessary orders. Risk=70 — Risk value. Values from 0.1 to 100. ProfitFactor=6 — Profit ratio. It is used for the calculation of the profit amount. Recommended values – from 0.1 to 25. FirstOrderIndicator=31 — Order opening indicator. The higher the value, the rarely orders are opened. Recommended values – from 10 to 70. LimitLotPersent=1 — The limiter of lot opening in the percentage of the Deposit. Recommended values – from 0.5 to 2. LimitDayPrice=70 — Trade restrictions based on the movement of a currency for one day. Recommended values – from 50 to 170. AutoGMT=true — Calculation of difference between GMT and server time using the terminal function. ManualGMTOffset=2 — Setting the difference between the terminal time and GMT (used for testing with any value of AutoGMT and in real trading with AutoGMT = false). RememberClosingLots=true — Remember lots closed. Recommended values = true. RememberClosingProfit=true — Remember the closed profit (loss). Recommended values = true. CloseEndofWeek — Close orders at the end of the week. Recommended values = true. StepLots=4 — The minimum distance between the orders. Recommended values – from 1 to 30. HedgeForce=15 — Hedge power coefficient. The maximum number of hedging lots = HedgeForce * MaxLot. Recommended 1-20. MagicNumber=3251 — Unique order number. AutoLot — The automatic money management. Auto recommended. ManualLot — If AutoLot is False, set Manual Lot. ManualProfit — If AutoLot is False, set Manual needed profit. ResetFiles — Reseting Expert Advisor memory. 1) Программа может по 3-4 дня хранить молчание, те позиции не открываются. Хотя, на мой скромный взгляд возможностей может быть предостаточно. 2) За период с 04.05.16 по 04.10.16, те 5 месяцев, выдала всего 7,5 тыс.руб (1500 руб. в месяц) при величине лота 0.02, всего одна пара EURUSD. Много это или мало - решайте сами. 3) И самая главная неприятность - в самом конце апреля буквально на 2-3 дня оставил программу без присмотра. В результате она наоткрывала кучу позиций и было слито более двух третей счета (было 67т.р, стало 21т.р.). Ничего особенного в настройках не менялось, без "экстрима" и прочей фигни. Величина лота стояла рекомендованная - 0.05, частота открытия и т.д. тоже. Всего одна пара EURUSD. 4) Особенности работы проги на рублевом счете нигде не освещены. Они следующие: прога открывает позицию на указанном периоде (15 минут) и если бар или свеча показавает плюс, даже если это всего рубль, по завершению таймфрейма, закрывает. На долларовом все, как написано - работает по достижение тейк профита. Такая странная особенность, про которую нигде не говорится. Если правильно помню, так работает Кенделстик трейдер, кстати. Исходя из изложенного опыта, который вряд ли можно назвать позитивным, хотелось бы попросить автора найти возможность доработать продукт, а так же, публиковать полное описание своего продукта, чтобы упомянутые "скрытые возможности" не стали неприятным сюрпризом для потребителя. 1. Modified procedure for tracking changes in the account balance. 2. By default ManualGMTOffcet = 3. Due to DST settings.